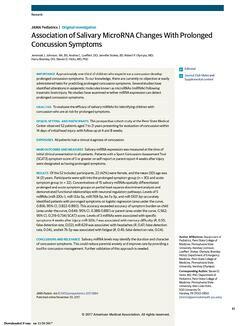 Could microRNA from saliva be a predictor of concussion symptoms in children? The issue of concussions has attracted considerable media coverage in recent years. According to the Centers for Disease Control and Prevention, 153 people in the United States die every day from traumatic brain injuries (TBI) that include concussions. Those who survive can face effects that last a few days, or the rest of their lives. Effects of concussions can include impaired thinking or memory, movement, sensation (e.g., vision or hearing), or emotional functioning (e.g., personality changes, depression). In 2013, about 2.8 million TBI-related emergency department visits, hospitalizations, and deaths occurred in the United States. We congratulate the research team on this very successful project and look forward to learning more as this approach is further validated.